Pension and farm Bila | FLORIAN PALACE - RBB HOTELS s.r.o. 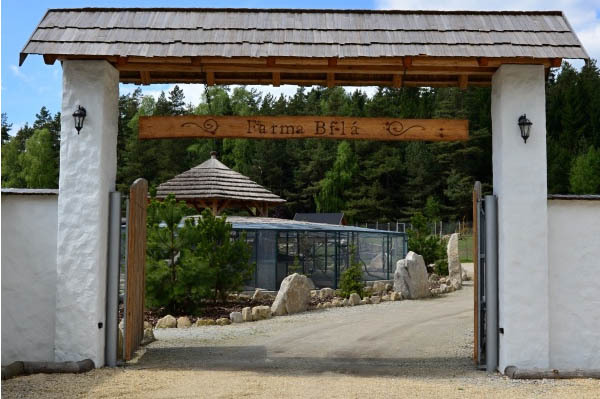 In the heart of Czech Canada, directly on the village square of Bila village close to Cimer, we run a pension that went through a reconstruction and a mini dairy production in a nearby distance. Are you curious how it all began? In the begginning we decided to get some lamas alpaca just for fun. Little by little we also bought goats, fallow-deers, antelopes and sheeps. What could not we miss is also a Shetland pony and a donkey. Our animal family started to grow and later, we also bought a mini zebu calf, Jersey cows or a nandu. Kangaroos are our every day joy. The proof of our farm´s prosperity is that our animals are giving birth to baby animals. In our mini dairy we produce home made dairy products from both, goat and cow milk. A large part in a quality and taste of our products is for sure our domestic way of breeding of our goats and cows. They are being grazed on a pasture in a beautiful landscape of Czech Canada region. We produce all the dairy products without preservatives, substitutes and food coloring. Our products are exclusively naturally produced. We serve our yoghurts, cheese and cheese spreads during the breakast in the Hotel Florian Palace, in our desserts in our Café and sweet-shop in the Commercial – Medical centre st. Florian or you can buy them in our kiosk which is also located in the Commercial – Medical centre st. Florian. You can also buy there our unigue rum dessert which we produce in a cooperation with a local company Fruko Schulz s.r.o. Our pension build up in South-Bohemian style is suitable to organizing corporate teambuilding and weddings. Our staff will arrange a complete wedding service according to the wishes of the bridegroom. Four our hotel guests we are more than happy to arrange a visit of our farm, mini dairy and a pension.